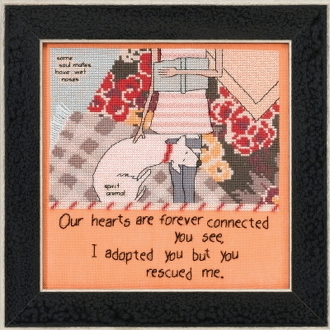 "Our hearts are forever connected you see, I adopted you but you rescued me." Design size: 7" x 7" (17.8cm x 17.8cm). Mill Hill Glass Beads, 28 count linen fabric, floss, needles and chart with instructions. Frame sold separately, see item 40-156, GBFRM21 Matte Black Frame.